This article is about the scientist. For his father the educator, see Alpheus Spring Packard, Sr.
Alpheus Spring Packard, Jr., LL.D. (February 19, 1839 – February 14, 1905) was an American entomologist and palaeontologist. He described over 500 new animal species – especially butterflies and moths – and was one of the founders of The American Naturalist. He was the son of Alpheus Spring Packard, Sr. (1798–1884) and the brother of William Alfred Packard. He was born in Brunswick, Maine and was Professor of Zoology and Geology at Brown University in Providence, Rhode Island from 1878 until his death. He was a vocal proponent of the Neo-Lamarckian theory of evolution. His chief work was the classification and anatomy of arthropods, and contributions to economic entomology, zoogeography, and the phylogeny and metamorphoses of insects. 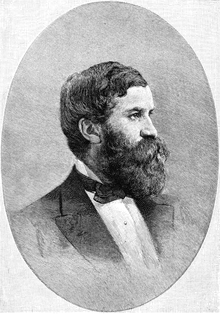 Packard was appointed to the United States Entomological Commission in 1877 where he served with Charles Valentine Riley and Cyrus Thomas. He wrote school textbooks, such as Zoölogy for High Schools and Colleges (eleventh edition, 1904). His Monograph of the Bombycine Moths of North America was published in three parts (1895, 1905, 1915, edited by T. D. A. Cockerell). Writings by A. S. Packard Jr.
Lamarck, the Founder of Evolution: His Life and Work (1901), French translation, 1903. Cockerell, T.D.A. (1920). "Biographical Memoir of Alpheus Spring Packard 1839-1905" (PDF). Biographical Memoirs of the National Academy of Sciences. 9: 181–236. Henshaw, Samuel (1887). The Entomological Writings of Dr. Alpheus Spring Packard. U.S. Department of Agriculture, Division of Entomology. Mallis, Arnold (1971). American Entomologists. Rutgers University Press. pp. 296–302. ISBN 0-8135-0686-7. Mead, A. D. "Alpheus Spring Packard (1839-1905)". Proceedings of the American Academy of Arts and Sciences. 53 (10): 848–850. JSTOR 25130026. Sorenson, W. Conner (1995). Brethren of the Net: American Entomologists, 1840-1880. University of Alabama Press. Wikimedia Commons has media related to Alpheus Spring Packard. Nomina circumscribentia insectorum On the phylogeny of the Lepidoptera. Zoologischer Anzeiger, 18 (465): 228-236 1895.